Sangeet ceremony as the name suggests is all about dance and music. It is one of the most enjoyable ceremonies before the wedding plans and is exclusively for women. Initially, the sangeet party was organized only by the bride's family but with changing times it is now observed by the groom's family as well. Also, it was a ritual which was only seen in North Indian weddings, but nowadays it is conducted in Bengali and South Indian marriages as well. 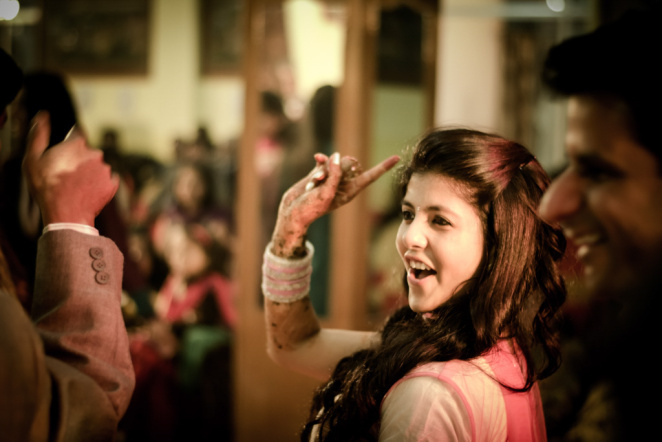 Sangeet ceremony is held few days before mehndi ceremony and comes as a time for joy and merriment amidst the hectic hustling bustling activities before marriage. Traditional the family of the bride invites female relatives and associates for Ladies sangeet, wherein all of them sing folk songs dedicated to marriage and bride. It is accompanied by Dholak and spoon, for the tune and beat. After this all the unmarried girls perform dance on different songs. Amidst celebration, ladies, crack jokes, tease the bride, merrily reminisce their youthful days and bless the girl for a prosperous married life. The environment quite often becomes emotional as the bride and her mother experience the pangs of separation from each other. After all the dance and singing is done, its time for refreshment. It mainly contains a number of snacks and sweet dishes. Women enjoy themselves to the fullest, making the environment light.